Newlyweds Roy and Celestial are living the New South American Dream. He is a young executive and she is an emerging artist. Neither could imagine that one argument would spiral their lives off course. Roy leaves to cool off, returns and makes up with his wife. Mere hours later, they are forced awake by authorities and Roy is arrested for a crime that Celestial knows for a fact he did not commit. Fast forward through our lovely justice system, he is sentenced to twelve years in prison. Celestial moves forward in her career and takes comfort in the arms of her childhood friend and best man at their wedding. She struggles to hang on to the love she felt for her husband. Meanwhile, Roy's love continues to grow stronger while they are apart. After five years, Roy's conviction is overturned and he returns to Atlanta hoping to resume their life together. It is not often I go above and beyond to spread the good word about a book. 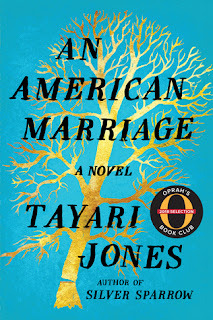 Tayari Jones' An American Marriage deserves every second of my praise. I documented my thoughts while reading through tweets and Goodreads updates. On Instagram, I posted a picture of me reading by the fire snuggled in my faux fur throw. I iMessaged my bestie in Houston and immediately recommended the book to my Chickadee, who in turn downloaded the audiobook and listened nonstop until the end. Alas, this is my official review to my bookhearts and newbies that may have missed all of my previous posts. Never have I ever loved a book where I loathed the main character(s). It is usually a huge turnoff. 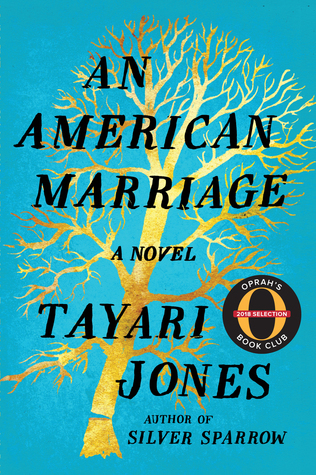 Somehow, Tayari Jones wrote these fleshed out characters so well that my disgust for them took a backseat. I noticed a lot of people expressing dislike for Roy, the husband. I am alone in the corner because Roy was actually my favorite. I empathized with him the most. It was Celestial, the wife, that I could not stand. I wanted to spit at the pages! But hardcovers cost too much to damage intentionally. Tayari Jones has a gift. The story of Silver Sparrow haunts me to this day and is one of my all-time favorite novels. The power of An American Marriage will linger on. It is not a book that will leave your memory easily. In fact, it could very well happen to you or another couple in real life. This is what makes the story so real and relevant. Circumstances are likely to enter any situation; it is how we handle it and how we treat others involved that helps us through. Bookhearts, find the time to read An American Marriage. I look forward to the many discussions to come. First up—talking about Roy and 'nem over good food and drinks with my Chickadee! Dinner and Drinks !! I loved this book , the characters are so relatable ! I actually liked Celestial ( and her name ) . It was right on time especially when ... moving right along let’s go get that “Drank” ! You are so welcome, sis. Definitely read it!